MLN1001VTGW : Mayline® Mayline Glass Top For 2-Drawer Pedestal V-Desk Base - 0.31" Table Top Thickness X 55" Width X 23.50"
Mayline Glass Top For 2-Drawer Pedestal V-Desk Base - 0.31" Table Top Thickness X 55" Width X 23.50"
Modernize Your Office With This Impressive V-Desk. The 5/16" Thick, Clear Glass Top Is Backed With White Lining For A Clean Look. Base Is Sold Separately. V-Style Metal Leg Structure Supports A Glass Top While Providing An Artistic Look. The Two-Drawer Pedestal Allows Easy Access To Convenient Storage With One Box Drawer And One File Drawer. File Drawer Holds Your Letter-Size Files From Front To Back And Legal-Size Files From Side To Side With The Included Hangrails. The File Drawer Fully Extends On Ball-Bearing Suspension While The Box Drawer Offers 3/4-Extension. Sturdy Base Is Made Of Steel With Adjustable Levelers And Leg Caps To Protect Your Floor.. Modernize Your Office With This Impressive V-Desk. 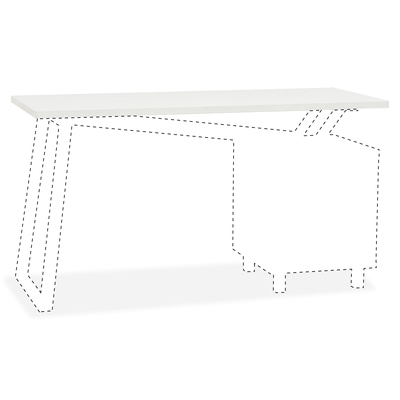 The 5/16" Thick, Clear Glass Top Is Backed With White Lining For A Clean Look. Base Is Sold Separately. V-Style Metal Leg Structure Supports A Glass Top While Providing An Artistic Look. The Two-Drawer Pedestal Allows Easy Access To Convenient Storage With One Box Drawer And One File Drawer. File Drawer Holds Your Letter-Size Files From Front To Back And Legal-Size Files From Side To Side With The Included Hangrails. The File Drawer Fully Extends On Ball-Bearing Suspension While The Box Drawer Offers 3/4-Extension. Sturdy Base Is Made Of Steel With Adjustable Levelers And Leg Caps To Protect Your Floor.